Habit: Plant < 2.5 m. Stem: +- 0 or short-decumbent, branched or not, rosettes at tips, +- at ground. Leaf: 50--100 cm, 2--6 cm wide, glaucous, +- dark green, expanded base +- 10 cm, 5 cm wide, +- red, margins fibrous-shredding. Inflorescence: 6--8 dm, purple-tinged, within to distal +- 1/4 exserted from rosettes, generally glabrous. Flower: pendent; perianth 5--13 cm, bell-shaped, parts lanceolate, fused > 1 mm, red-brown abaxially, +- white adaxially; pistil 5--8 cm. Fruit: berry-like, pendent in age, 15--17 cm, fleshy in youth. Ecology: Uncommon. Dry Joshua-tree woodland; Elevation: 800--1300 m. Bioregional Distribution: e DMtns; Distribution Outside California: to Colorado, Texas, Mexico. Flowering Time: May--Jun Note: Reported to hybridize with Yucca schidigera. A 2nd variety in Arizona, New Mexico, Mexico. Citation for this treatment: William J. Hess 2012, Yucca baccata var. baccata, in Jepson Flora Project (eds.) 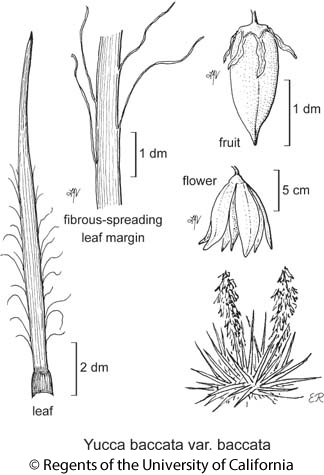 Jepson eFlora, http://ucjeps.berkeley.edu/eflora/eflora_display.php?tid=67839, accessed on April 19, 2019.